Something about this bit of kitschy lawn art struck me, though I’m not exactly sure why. Those glass balls have clearly gone out of style in recent years, but I kind of liked the way the angel statue was holding it while sitting in a wagon. 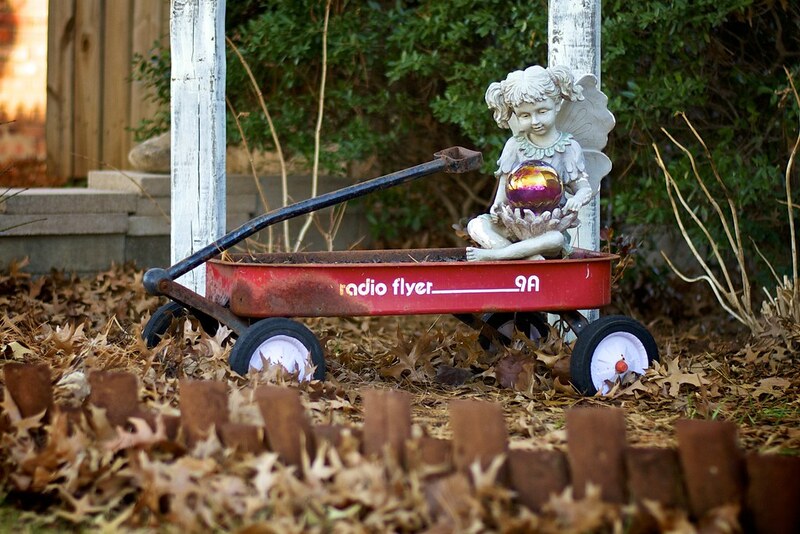 You don’t see Radio Flyer wagons like that much anymore, and this one had clearly seen a lot of use in its day. I like to think that this wagon spent years toting kids around and is now living out its remaining days in relative peace and quiet. But if any neighborhood children dared to ask the owners if they could take it for a ride, they would chuck the statue and let them take it out for a spin in a heartbeat.